ð 1. Adopt a Sunnah Wudu: It is reported that the Prophet Muhammad would perform the entire wudu from a bowl two-hands full together (approximately 0.5 liter) and he warned against excess in performing ablution (israf). ð 2. Quick Showers: Reduce shower time by 20%. On average, a ten minute shower results in twenty-five gallons of water down the drain. ð 3. Eliminate Plastic Water Bottles: Plastic should be minimized because of harm related to global warming and health. ð 4. Eliminate Styrofoam. Styrofoam is unrecyclable and non-biodegradable, which means that it will persist as garbage even a thousand year after its use. ð 5. Adopt a Reusable water bottle/mug whether you are at the mosque, work, or home. Avoid bringing plastic disposable bottles to the mosque during iftars and for tarawih. ð 6. Reduce Disposable Party items: Remove or reduce all of disposable items from your parties and save money while doing so. ð 7. Reduce food waste and over consumption by eating moderately, keeping in mind the hadith (fill ⅓ of stomach with food, ⅓ water, and ⅓ empty). Take only what you can comfortably finish. ð 8. Sunnah Iftars: Eat More Fruits & Vegetables, Less Meat: The Prophet’s diet consisted mostly of grains, dates, water, milk, honey, vegetables and fruits. Meat was not daily part of his diet. ð 9. Make an effort to carpool. ð 10. Plant or expand a garden this year (less grass, more trees and plants) at home or the mosque and remember that planting a tree is a charity. Imam Zaid invites all of you to Work for a Better Future - better environment. 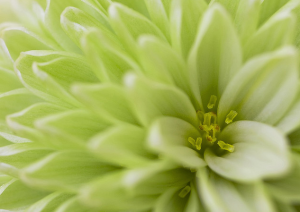 We are making a concerted effort to partner up with individuals like yourself to make a grassroots level green effort. Please take a Green Ramadan online Pledge (No cost) and encourage your friends to do so. Imam Zaid gives a shout-out to all of the brothers and sisters working on the Green Ramadan project. A wonderful article from Imam Suhaib Webb's website on Five Ways to Green your Ramadan. 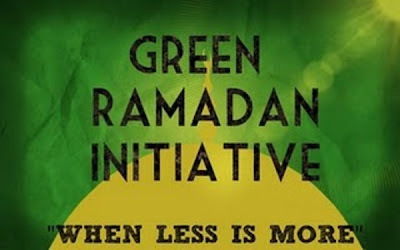 GREEN RAMADAN INITIATIVE IN THE PAPERS! Hold up a 16oz bottle of water. The Prophet (AS) used to use about 80% of the water in that bottle. 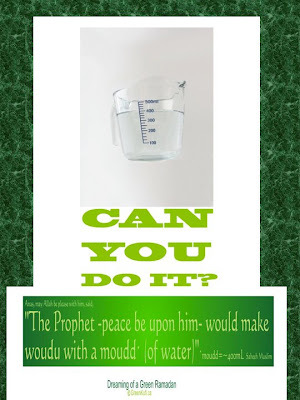 How often do we open the faucet at full blast when making wudhu? This is a remarkably easy Sunnah to implement and very easy to call others to it. So go for it...get yourself some rewards this Ramadan by conserving water and teach others to do the same!